Play is one of the primary mechanisms children and young people use to learn about the world around them. Both natural and instinctive, play enables children to test their own abilities and learn and develop new skills and knowledge. As such play has a critical role in schools – offering both an outlet for expending energy during break times and as a means of contributing to learning through the curriculum. The importance of schools as environments for play also cannot be understated. For many children and young people, the school playground represents the only open, accessible space available to them on a regular basis that allows them to engage in physically challenging and socially developmental outdoor play. Through play children explore mathematical concepts including the differing size, shape and weight of objects; through water play the volume of objects and water displacement and enhance their understanding of numbers by counting as part of traditional games. Play offers children an opportunity to communicate with others (both other children and adults) in ways that are usually not available to them, for example through imaginary play. As such play enhances language development skills and support increased levels of literacy. From the moment we are born we are scientists – exploring, experimenting, observing, testing, verifying our assumptions and making new discoveries about the world around us. Coincidentally these approaches are all key elements of play! Play in outdoor natural environments offers a multitude of opportunities to learn about geography and the world around them. From interacting with the natural environment – mud, trees, grass, stones – to searching for flora and fauna play can enhance and build on traditional classroom approaches to learning. Play is the most natural and instinctive way for children to develop and maintain good health and well-being. Through physical play children can build active and healthy bodies, reducing obesity and helping to establish life-long physical activity patterns. Play also actively contributes to healthy brain development, enhances learning capacity and supports resilience. When given the opportunity through innovative and challenging play children are able to test out and challenge their abilities in a natural way, enhancing their capacity to assess and manage risk as they develop. All children have a desire to play and, when given the opportunity to come together with children from other community and ethnic backgrounds through play, are able to develop social connections and develop positive relations. For over 12 years PlayBoard has been working to improve children’s school based play experiences through a range of training and play support programmes. 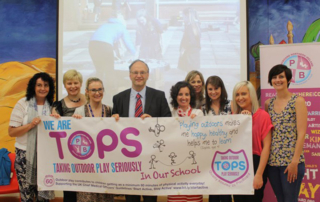 This includes PlayBoard’s Positive PlayGrounds programme which has been delivered in over two hundred and fifty primary schools giving children, teaching and non-teaching staff the opportunity to explore a wide range of issues relating to play including play theory, play types, playground policy, the playground environment and co-operative games. 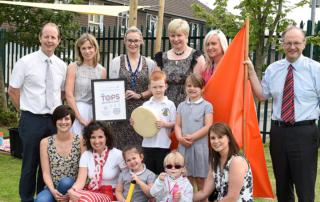 Building on the experience gained through Positive Playgrounds, in 2015 PlayBoard developed the ‘TOPS’ Quality Assurance Programme and Award for Outdoor Play aimed at supporting schools to bring about a comprehensive transformation of the school environment in order to encourage and support outdoor play. 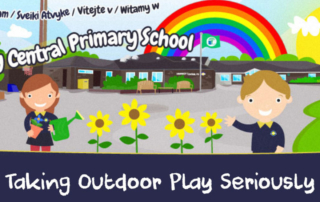 Through both the ‘Positive Playgrounds’ and ‘Quality Assurance’ programmes schools are able to work towards a fuller utilisation of the outdoor environment in order to enhance opportunities for play-based curricular learning; broaden active and social play; and better meet children’s natural play needs. 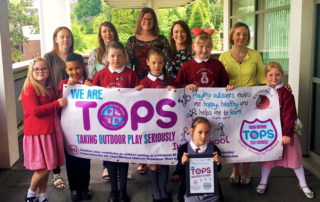 TOPS Awards 2017 – Four Schools Receive TOPS Awards!